Join Bangladesh Navy 2017 : Bangladesh Navy has Published a Job Circular 2017 for Officer Cadet 2018 Batch Male First-Group . Bangladesh Navy Job Circular 2017 and related information can be found on this website. Join Bangladesh Navy as a Officer Cadet 2018 Batch First Group Male. Join Bangladesh Navy 2017 Job Circular . Officer Cadet at Bangladesh Navy (Bangladesh Nou Bahini in Bangla) . You Can become Aircraft, Captain of The Ship , Navy Commander and Submariner through this Circular. Interested Candidates can apply for this post officer Cadet 2018 Male Batch. The HSC Examines of 2017 also can apply for those positions. 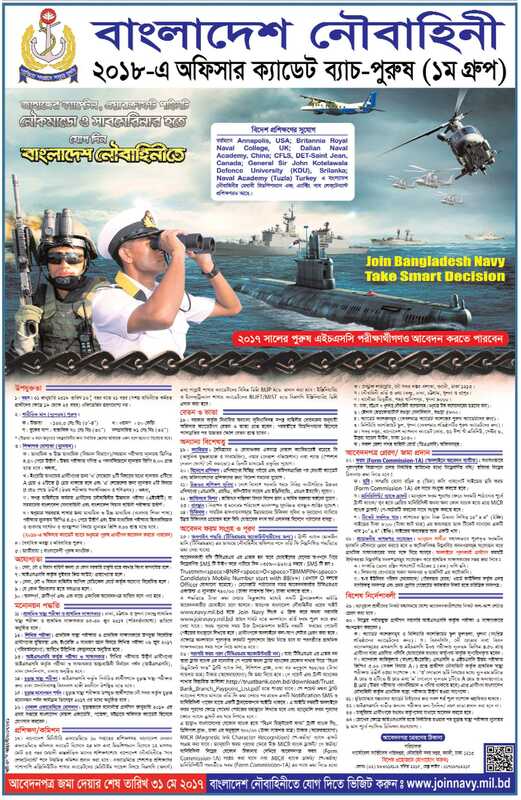 The Bangladesh Navy Online Application Form and application process will be completed by steps . The Candidates Who have Trust Bank account can pay the Navy application fees by following the instruction described in the circular. The Candidates who does not have non-Trust bank account also can apply by paying fees at the nearest trust bank of tk 700. After paying fees candidates needs to go the official address of www.joinnavy.mil.bd or www.navy.mil.bd and have to follow the instructions. ami ki apply korte parbo??? amr ssc point 4. 50..